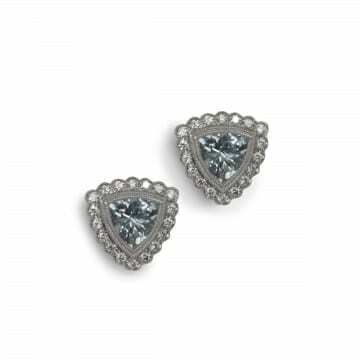 Boston MA diamond hoop earrings, sapphire earring studs. The 14kt white gold amethyst & diamond earrings each feature (1) checkerboard cut flower shape amethyst and (1) marquise cut amethyst, both surrounded by a frame of round brilliant diamonds. The (4) amethyst have a carat weight of 10.40ctw. The (101) diamonds have a carat weight of 0.46ctw. 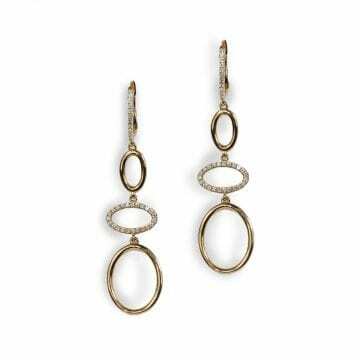 The 14kt rose gold earrings are set with (70) round brilliant cut diamonds that have a carat weight of 0.23ctw. 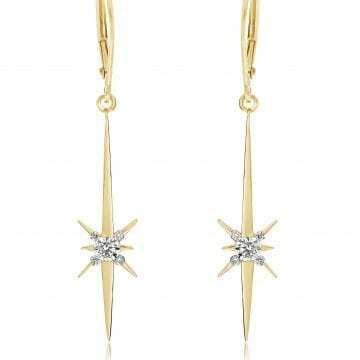 The 14kt yellow gold earrings feature (10) round brilliant cut diamonds that have a carat weight of 0.38ctw. From the North Star Collection. The 14kt white gold emerald & diamond earrings are a flower style, each set with (4) round brilliant cut emeralds. The (8) emeralds have a carat weight of 0.52ctw. The emeralds are surrounded by a frame of round brilliant cut diamonds. The (66) diamonds have a carat weight of 0.23ctw. The 18k rose gold earrings each feature a cushion cut morganite (1.56ctw) accented by round brilliant cut diamonds (0.34ctw.) 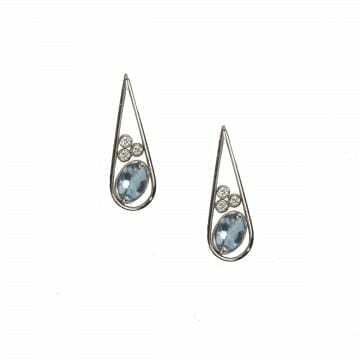 From the Dove's Jewelry Rose Collection. 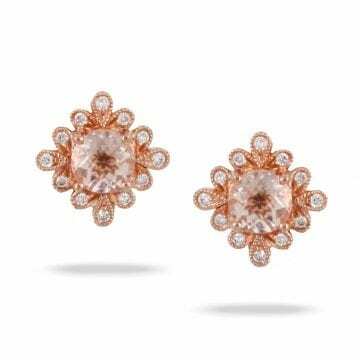 The 18kt rose gold earrings each feature one round brilliant cut morganite (0.98ctw) surrounded by a halo of round brilliant cut diamonds (0.14ctw.) 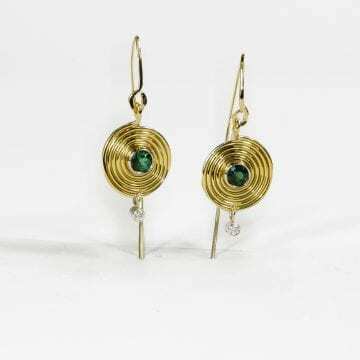 From the Dove's Jewelry Rose Collection. 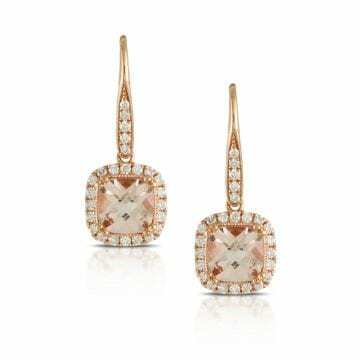 peach morganite and diamond earrings from the Doves Jewelry Rose Collection. 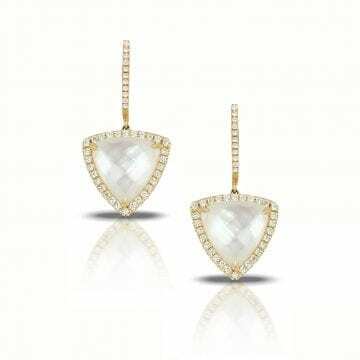 The 18kt yellow gold earrings feature a combination of white mother of pearl & clear quartz (6.40ctw) surrounded by a halo of round brilliant cut diamonds (0.43ctw.) From the Dove's Jewelry White Orchid Collection. 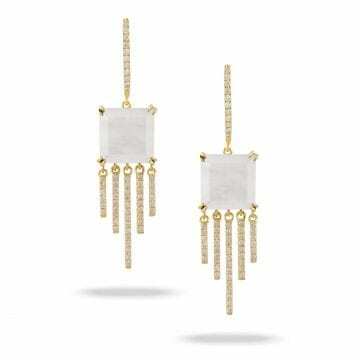 The 18kt yellow gold earrings feature a combination of mother of pearls & clear quartz (5.59ctw) accented by round brilliant diamonds (0.45ctw.) From the Dove's Jewelry White Orchid Collection. 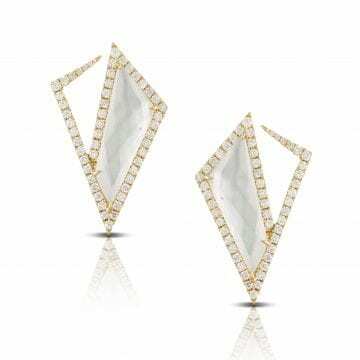 The 18kt yellow gold earrings feature a combination of mother of pearl & clear quartz (6.97ctw) accented by round brilliant cut diamonds (1.12ctw.) From the Dove's Jewelry White Orchid Collection.